Let us be reasonable, crocus flowers cannot protect themselves. What do we offer? Firstly, the knowledge about crocus flowers, the Tatras, the Commune of Kościelisko. Secondly, alternative sights where crocuses can be admired. Thirdly, answers to questions: 'How to do it?, Where to set off from?' We want to invite you to the conscious and responsible contact with nature. Polana Chochołowska (clearing) is the most popular place with crocus lovers. Indeed, one can find there the plenitude of crocus flowers, even a dozen million. In recent years the Chochołowska Valley has been flooded with tourists who come at weekends to see blossoming flowers. As a result, there are immense traffic jams, queues to the Tatra National Park entry points and crowds of people on Tatra trails. It might be worth visiting other places which are also full of purple flowers whereas your contact with nature will be much more convenient. What is more, one can get familiar with less known mountain trails and see the Tatras and Podhale from a bit different perspective. Crocus (Crocus scepusiensis) is the first herald of spring. It appears at the turn of March and April covering the Tatra meadows, pastures with a spectacular purple coat. Due to its shape, it is called 'tulipanek' (little tulip) by highlanders. This charming flower is one of the most popular Tatra symbols. Research on crocus flowers has been done since mid-1970s. The biggest clusters of crocus flowers can be observed in Chochołowska and Huciska Clearings in the Chochołowska Valley, Wyżnia Kira Miętusia, Pisana and Smytnia Clearings in the Kościeliska Valley and in Kalatówki Clearing in the Bystra Valley. 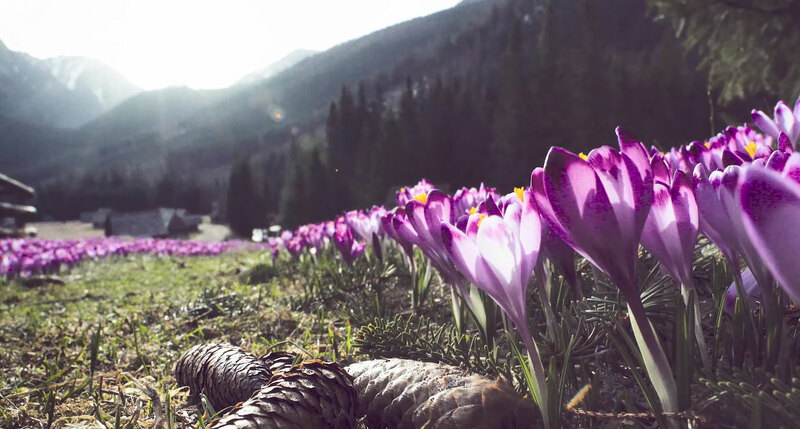 The crocus population in Polana Chochołowska, which is the richest in these flowers and one of the largest clearings, averaged 14 million blossoming flowers in years 2005-2010. At the same time the overall number, including the barren ones, fluctuated between 36-52 million. This impressive number is closely dependent on active shepherding. Crocuses are more likely to grow where sheep graze; they need nitrogen-fertilized soil. If shepherding was stopped for 30-50 years and meadows were left unused, the whole crocus population would disappear not only in Polana Chochołowska, but also in other Tatra clearings. For example, Polana Kalatówki, another clearing popular with tourists, has crocus population which is lower by 2/3 than in Polana Chochołowska. 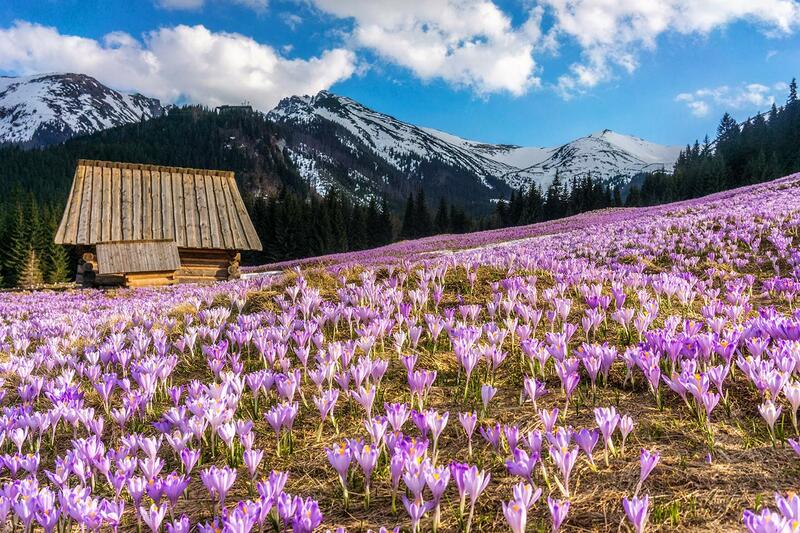 You may wonder how many crocus flowers there are in the Polish Tatras. Fortunately, there are so many of them that one cannot count precisely. Currently, thorough research, which has been done in the last 15 years, estimates the overall number of crocus flowers for 120-130 million! Crocus flowers are protected by law in Poland. Unfortunately many of them are trampled on by tourists every year. Therefore we ask: Mind your step, please.